With his iconic white beard and billowy shirts, Andrew Weil, MD, is a familiar figure to many. He's been a frequent guest on television, and has graced the cover of TIME twice. As a pioneer of integrative medicine, he's passionate about promoting an optimal, anti-inflammatory eating style for healthful aging. He's also an advocate for bringing nutrition education into the medical school curriculum, which he hopes to accomplish with the help of his annual Nutrition & Health State of the Science and Clinical Applications Conference that reaches thousands of physicians, nurses, dietitians, and other health care practitioners each year, as well as his work as founder and director of the Arizona Center for Integrative Medicine at the University of Arizona, which provides a comprehensive curriculum in integrative medicine. It all started in 1942, when Weil was born in Philadelphia. He received his AB degree in biology from Harvard in 1964, and an MD from Harvard Medical School in 1968. After completing his medical internship and working for one year with the National Institute of Mental Health, Weil wrote his first book, The Natural Mind. During 1971 through 1975, he traveled around the world as a fellow of the Institute of Current World Affairs. This is where his interest in medicinal plants and traditional medicine took root, and he accepted a post on the research staff of the Harvard Botanical Museum where he investigated medicinal and psychoactive plants. Today, Weil lives in Tucson, Arizona, and serves as director of the Arizona Center for Integrative Medicine at the University of Arizona, where he's also the Lovell-Jones Endowed Chair in Integrative Rheumatology, and is a clinical professor of medicine and a professor of public health. He's the editorial director of his popular website DrWeil.com (www.drweil.com), appears in video programs featured on PBS, and writes a monthly column for Prevention magazine and the popular Dr. Andrew Weil's Self Healing monthly newsletter. Weil has authored countless scientific and mainstream articles, as well as 13 books: The Natural Mind; The Marriage of the Sun and Moon; From Chocolate to Morphine (with Winifred Rosen); Health and Healing; Natural Health, Natural Medicine; Spontaneous Healing; 8 Weeks to Optimum Health; Eating Well for Optimum Health: The Essential Guide to Bringing Health and Pleasure Back to Eating; The Healthy Kitchen: Recipes for a Better Body, Life, and Spirit (with Rosie Daley); Healthy Aging: A Lifelong Guide to Your Well-Being; Why Our Health Matters: A Vision of Medicine That Can Transform Our Future; Spontaneous Happiness (published in 2011); and True Food: Seasonal, Sustainable, Simple, Pure (with Sam Fox and Michael Stebner, published in October 2012). Oxford University Press currently is producing the Weil Integrative Medicine Library, a series of volumes for clinicians in various medical specialties; the first of these, Integrative Oncology (coedited with Donald Abrams, MD) appeared in 2009. Since then, Integrative Psychiatry, Integrative Pediatrics, Integrative Women's Health, Integrative Rheumatology, Integrative Cardiology, Integrative Dermatology, Integrative Nursing, and Integrative Men's Health have been published, and more volumes are in progress. Today's Dietitian (TD) sat down with Weil for a conversation on how nutrition can combat chronic disease as well as how dietitians fit into the role of public health defender. TD: How powerful do you think diet is in public health today? Weil: I think it's a huge factor in the obesity epidemic, childhood obesity, type 2 diabetes, and many chronic health conditions. It gets short shrift in the discussions of health and medicine today, yet it's a major issue. TD: In what way does our current health care system fail to take into consideration the power of diet in disease prevention and treatment? Weil: There's a range of none to poor nutrition education in medical curriculum. Doctors are functionally illiterate in nutrition, unless they make an effort to get themselves up to speed. TD: What role can dietitians play in today's health crisis? Weil: Potentially a great role. I would love to see more collaboration between registered dietitians and doctors, with more doctors referring patients to dietitians. Doctors don't think to make referrals to dietitians—the time crunch in the office is a major problem. Doctors are working in health care systems that force them to see how many patients they can see in an hour. They don't even have time to talk about diet. And then they can be working in a facility with fast-food restaurants on the premises—the whole system needs a major overhaul. The dietitian field has been somewhat dominated by those who are mostly tied to food industry. There's a new generation of RDs who really get it; they're eager for new information. Still, it's a challenge. I gave a keynote talk at the annual Academy of Nutrition and Dietetics' meeting about eight years ago in Anaheim, [California]. I saw dietitians carrying tote bags advertising an artificial sweetener. This breaks a connection between nutrition and health, because of significant influence from industry on nutrition information. TD: Often patients have multiple preventable chronic conditions when they walk in to their doctor's office, yet diet rarely gets addressed. What can be done about this scenario? Weil: I'm surprised to see this in the health community; nutrition researchers have reached consensus on some of the big questions of health and disease prevention. Yet it's not making it into the training of doctors and the general public. Dietitians should stay up-to-date on nutrition science. For example, I organize the Nutrition & Health State of the Science and Clinical Applications Conference, and there's a major attendance by RDs. And I strongly encourage dietitians to consider enrolling in IHeLp—the Integrative Health and Lifestyle program offered through Arizona Center for Integrative Medicine. The program is accepting dietitians, and it's a cutting-edge learning opportunity for understanding nutrition science. I've been organizing it for more than 10 years. TD: What suggestions do you have for dietitians to become more effective players in getting nutrition messages to the public? Weil: The first step is getting up to speed on the new consensus of nutrition information out there, and finding ways to present that information to the institutions where they work, and with other health care professionals and patients. TD: In the world of nutrition science and consensus, often it takes time for emerging evidence to be accepted by large health organizations. This is a good thing, as it helps avoid confusion when scientific results are inconclusive, but sometimes it takes too long and the public moves ahead on its own. What are your thoughts on how to interpret and translate emerging science into evidence-based recommendations as a health care professional? Weil: I think there really is consensus on a lot of these big issues. It's important to be armed with references that are solid, so you can support the statements you make. For instance, the role of inflammation in chronic diseases is a strong hypothesis now—it even has a role in depression and mental health. A new generation of people can push for change in practice, because institutions and health organizations change very slowly. It's a huge problem, and it feeds into doctors being poorly educated in this area. 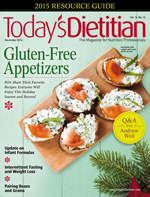 Dietitians can help bring about change. TD: There's so much misinformation—on television and the Internet and in books and magazines—on nutrition. People are overloaded. They also don't trust certain organizations and authorities. How can dietitians cut through the hype to give people the nutrition messages that will really help them? Weil: This is an enormous problem. There's such confusion out there because of misinformation and disinformation. It leads the general public to give up and just eat what they want. We need to counteract this by pointing people to sources of reliable information. I think there's a tendency in the community to demonize whole groups of foods and macronutrients, such as carbs, grains, and sugar. I don't think that's a good trend. All I can say is that dietitians need to really inform themselves about nutrition consensus and have good references at hand to support what they say. Give out good messages. For example, I hear some RDs say there are no good and bad foods, but that's wrong. Margarine is bad. Processed foods are bad. TD: Dietitians deal with food, so we've had a long relationship with the food industry. What advice do you have for our profession in negotiating this relationship wisely? Weil: Yes, it's tough to have a relationship with industry. You can try to use your influence to make positive changes within the industry. But you need to be cautious about accepting financial support from certain industries, such as the soda industry. And it's not good to be toting 10,000 tote bags at your conference advertising artificial sweeteners. TD: Tell us a little bit about your mission and goals when you established your restaurants True Food Kitchen. Weil: Well, I'm a good home cook, but I'm not a professional chef. Many people have said that I should open a restaurant, but it looked like a tough business. I was introduced to a successful restaurateur—Sam Fox—who suggested I bring the world of good dining together with the world of good nutrition. Initially though, Sam didn't think healthful food would sell. I heard from a lot of people that the kind of food I make for me and other people is very appealing—it tastes good and it also applies my principles of good nutrition. So I slowly convinced him that this was worth a try. It's my food and my philosophy adapted to a restaurant setting. People love it. I hope it inspires people to cook like this for themselves. The food starts with good ingredients and simple preparation, and the dishes aren't fussy or overcomplicated. I published the True Food cookbook last year, and I'm working on another one, which will feature 30 minutes or less recipes with quick, simple ideas. But above all else, my food is delicious and happens to be good for you. My main goal is to demonstrate that food that's delicious and good for you doesn't have to be in opposition. TD: How can your annual Nutrition & Health State of the Science and Clinical Applications Conference help dietitians? Weil: This conference provides information that you can't get elsewhere in one place. We have the leading researchers in nutrition, and present the latest findings in a form that's evidence-based. We provide information that many people have not gotten from conventional education, and we make it relevant to their clients. There's so much stuff in the news that makes people confused; we love to see dietitians be able to give solid evidence-based information to the public. — Sharon Palmer, RDN, is nutrition editor of Today's Dietitian and the author of The Plant-Powered Diet and Plant-Powered for Life. At the core of Weil's optimal eating plan is a focus on whole, minimally processed foods, such as vegetables, fruits, whole grains, legumes, seafood, healthful fats, whole soy foods, mushrooms, herbs and spices, tea, red wine (moderate), and dark chocolate (sparingly)—a diet plan with which most dietitians wholeheartedly agree. Weil's Anti-Inflammatory Diet Pyramid is available on his website (www.drweil.com). The Nutrition & Health State of the Science and Clinical Applications Conference is one of the most celebrated nutrition conferences of the year. Weil brings health care professionals together each spring to learn about and discuss the latest advances in nutrition science. Those interested in hearing about the latest nutrition controversies—from sugar to saturated fat, integrative nutrition strategies, and health science from around the world from some of the profession's leading experts—will not be disappointed. Past speakers have included David Katz, Ken Cook, Christopher Gardner, Walter Willett, Robert Lustig, Marion Nestle, Michael Pollan, and Justin Sonnenburg. To top it off, the food at the conference exemplifies Weil's anti-inflammatory diet style. Visit http://nutritionandhealthconf.org to learn more. One of Weil's most celebrated accomplishments is his restaurant, True Food Kitchen. Weil impressed Sam Fox, a restaurateur in Phoenix, with his delicious healthful culinary style. Soon Fox realized that Weil's concept for a restaurant—one that serves great food that just happens to be good for you—could succeed. In 2008, the first True Food Kitchen opened in Phoenix, was an immediate success, and led to the team opening new locations throughout the southwest, with the long-term goal of a national rollout. The concept at True Food Kitchen locations is that all dishes adhere to Weil's principles of the anti-inflammatory diet. Combining delicious flavors, healthful nutrients, and environmental awareness, the restaurant offers a unique dining experience. Influenced by Mediterranean, Asian, and Californian cuisine, the menu is sourced from local, organic farms as much as possible, and includes appetizers, soups, salads, pasta, rice and noodle dishes, sandwiches, brick oven pizzas, and desserts. Some popular dishes include Wild Smoked Salmon with Shaved Radishes; Lemon Cream and Wasabi Peas; Sashimi Tuna Salad with Avocado, Cucumber, Tomato, Edamame, and Ginger; Curry Chicken with Rice Noodles; Tuscan Kale Salad; Bok Choy and Lemongrass; and Fresh Tomato Pizza with Pasilla Chile and Manchego. In addition, natural juice blends, coffee drinks, tea drinks, sparkling wine cocktails, beer, and wine (organic, biodynamic, and/or sustainably farmed) are available. The restaurant environment is "green," featuring reclaimed wood, recycled tiles, and high-efficiency equipment. True Food Kitchen restaurants are located in Phoenix; Scottsdale, Arizona; Newport Beach, California; Santa Monica, California; San Diego; Denver; Houston; Dallas; and Atlanta. New locations are set to open in Fairfax, Virginia. To learn more, visit www.truefoodkitchen.com. 2. Pierce the spaghetti squash with a fork in several places. Microwave it on high power for 12 minutes, rotating it every 3 minutes. Let the squash cool, then cut it in half lengthwise and scoop out the seeds with a spoon. Scoop out the flesh into a large bowl. Add the zucchini, onions, and tomato sauce. Season with salt and pepper to taste. Spoon the mixture into a 3-quart shallow baking pan. Bake for 40 to 45 minutes. 3. Remove the baking pan from the oven and turn the oven to broil. Top the vegetables with the grated cheese and place under the broiler until golden brown, about 5 minutes. Let sit for 5 to 10 minutes before serving. Heat the canola oil in a large nonstick skillet over low heat. Add the onions and cook for 30 minutes, stirring often, until they're soft and brown. Let cool, and store any leftover onions in a covered container in the refrigerator for up to three days. 1. Heat the oil in a saucepan over medium heat. Add the garlic, reduce the heat to low, and cook for 2 minutes, stirring constantly. Add the tomatoes, salt, allspice, pepper, basil, and oregano. Bring to a simmer, and simmer for 20 minutes. 2. Allow the sauce to cool for 20 minutes, then transfer to a blender. Hold the lid down firmly with a clean, folded towel over it. Start on low speed and blend until it's a smooth sauce. Store leftover sauce in a covered container in the refrigerator for up to five days or in the freezer for up to three months.